Celebrate International Chest Day With A Double Assault! Only have time for one chest workout today? Make it this classic, from the man with one of the most iconic torsos of all time. Have time for two workouts? He's got you covered there, too. 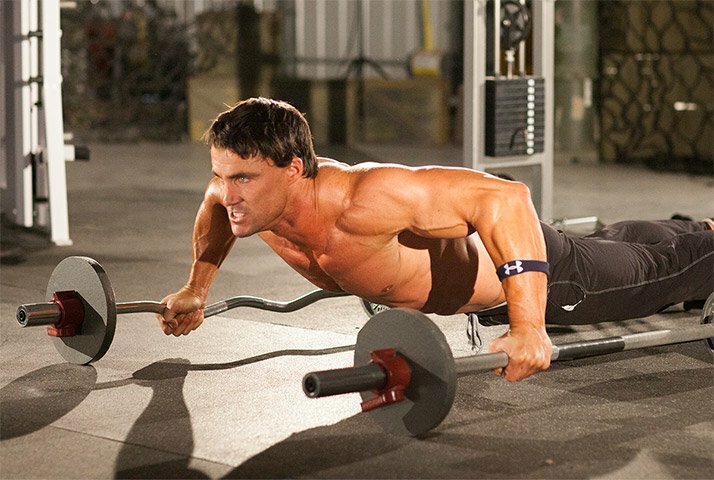 The late, great fitness icon Greg Plitt didn't mess around when it came to training his chest. He pushed every muscle fiber to its limit in the morning. And then, in the evening, he did it again. In fact, every workout in his iconic four-week MFT-28 Military Fitness Training Plan is split into "Morning Mass" and a second, evening workout. Is this an everyday, all-the-time approach? Not for most people. But, if you've got the time today, try this two-headed monster, straight from day one of MFT-28. This is how Greg's coveted chest was built. It will hurt for days afterward, but it'll be worth it. Begin this five-position exercise on the ground inside the Smith machine, with the bar racked at the top of the cage. Perform 8-12 wide push-ups, then hook the bar on the lowest rung of the Smith machine. Grip the bar and perform 8-12 incline push-ups. Raise the bar to the next rung, use a slightly narrower grip, and perform 8-12 medium-grip incline push-ups. Continue raising the bar and performing the prescribed exercises. The entire series counts as one set. 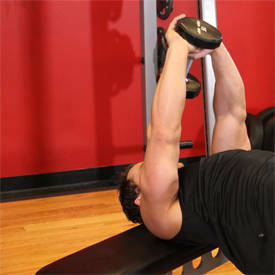 Perform 3 reps of heavy dumbbell bench press. Drop the weight by 20 pounds; perform 5 more reps of dumbbell bench. Drop the weight by another 20 pounds and perform 7 reps. Drop the weight once again, perform 9 reps of dumbbell bench, and then perform dumbbell flyes to failure. This is one set. Position a 30-degree incline bench inside a cable station. Select a weight that you can perform for at least one rep. Perform one rep of incline chest press, drop the weight by one pin position, perform two reps, drop the weight by another position, perform three reps, and continue dropping the weight and adding reps until you're up to ten reps. This is one set. Each set is 55 total reps.
Each set of this giant set is a "half-half-whole" series. To begin, perform one rep of cable crossover and hold the contracted position. Perform 8-12 reps of single-arm cable crossover with your left arm, immediately followed by 8-12 reps with your right arm, followed immediately by 8-12 reps of full cable crossover. Step back and perform the cable iron cross to failure. Note: Because you can't adjust the load on bodyweight exercises, perform reps according to your fitness level. Elevate your heart rate and tax your muscles without reaching failure. Greg, of course, wasn't even done after two chest workouts. He added in the brutal Abdominal Assault circuit—every day of weeks 1 and 3 of the program. Try the full program for yourself and see what you're made of.